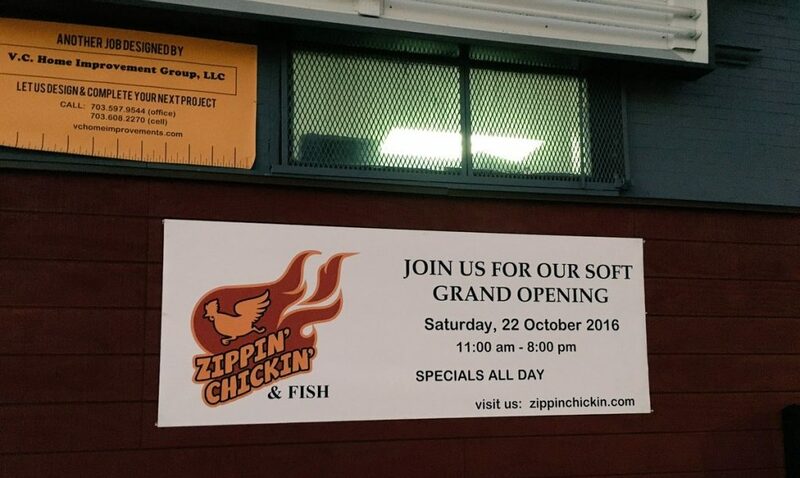 “I went to Zippin Chickin Saturday for it’s soft grand opening around 1 p.m. It was going with an “opening day special menu” which seemed to have items discounted significantly. I got the “6 piece dinner platter,” which consisted of six chicken tenders, two sides (I chose french fries and collard greens), and either corn muffin (which I chose) or hush puppies. All of that cost a measly $9. Back to the food: the chicken looked and tasted good–it wasn’t like rubbery chicken you get at fast food restaurants. Even better was that the breading on the fried tenders was not overdone. It added good flavor without overwhelming the chicken. The tenders came unsauced, while Zippin Chickin provided two small containers of Sweet Baby Rays bbq sauce in the bag. The fries were good, and they were plentiful. The collard greens were also good, not too bitter and not overly salty. I thought they were just right. My fiance, who is an outstanding baker, loved the corn muffin, stating that the top had a good crunch and the cornmeal was not overly dry. Although we didn’t get any drinks, Zippin Chickin was selling sodas for 50 cents.